Warm wooly mittens keep hands toasty and hearts happy on cold wintry days. Make them for the tree, or fill them (they are perfectly sized for gift cards or other treasures) and give them as special gifts to family and friends. Design motifs include a spicy gingerbread, star-shaped snowman, holly with berries, a jolly Santa, star-topped tree, and an ice skate. Red and green cuffs with embroidery embellishment add charm. Each mitten is approximately 4" x 4 1/2". 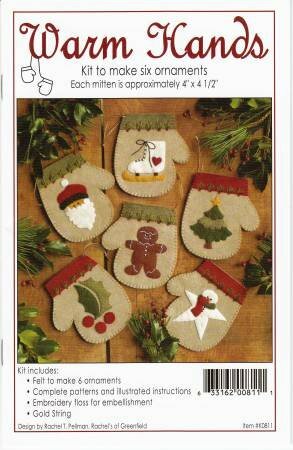 Kit includes woolfelt, embroidery floss, gold string plus precise patterns and illustrated instructions to make 6 mittens. Colors are sandstone, red, green, gold, brown, and white.